Cheapass Games has launched their Kickstarter campaign for Cheapass Games in Black and White, a book that recounts the creation of the Cheapass Games company and its games. 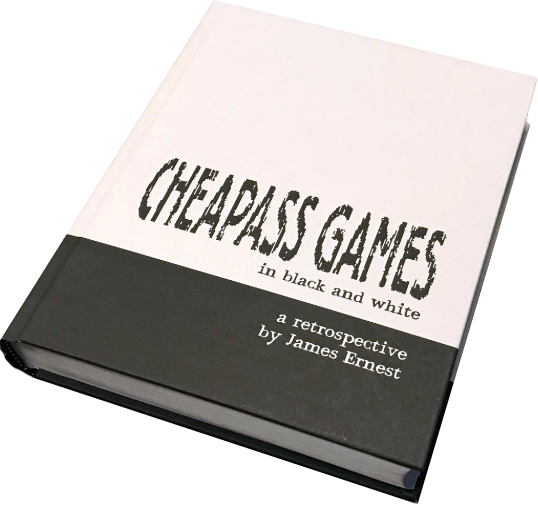 Written by company founder and game designer James Ernest, Cheapass Games in Black and White, includes rules, design notes, anecdotes, and more. Jess: I had the chance to preview a bit of the book and really enjoyed it. James Ernest has a relatable style and a bevy of fun stories that will keep you entertained as you learn the history of Cheapass. To honor the release of the Kickstarter, Cheapass Games is making the classic print-and-plays available once more in all their original black-and-white glory. To help you enjoy the games, James Ernest has released a series of instructional videos on YouTube channel to assist gamers in constructing print-and-play components such as game boards, playing cards, and more. Cheapass Games in Black and White will be available in hardcover as well as an e-book. A limited number of bookplates signed by Ernest are also available. Select games will also be streamed during the second week of the campaign. A schedule will be posted on cheapass.com. Visit the Kickstarter campaign for Cheapass Games in Black and White here.